Finding bedding for teenagers can be really tricky, I find. They’re WELL past the stage of wanting their favourite comic book hero or tv character sleeping next to them each night, and yet they’re usually not ready (especially the boys) for the adult offerings of floral patterns or plain old block colours that seem to be the only alternative. And out of the website and onto his bed, how does it stand up? I clearly didn’t read the description clearly, because I was surprised to see the star pattern is actually embroidered on and not printed. Such a nice touch that really lifts the set. The biggest test of all, of course, is how it feels. The boy is VERY fussy, and chooses to sleep under an old and faded spiderman duvet cover rather than a newer, more suitable cover that isn’t 100% cotton and therefore doesn’t feel as nice on his skin. The Bright Stars set? Passes with flying colours. My only issue now is that he won’t sleep under anything else, so I have to wash it and dry it in a day! The set washes beautifully, and being 100% organic cotton it dries fast too. It does need an iron, but I’m sorry to say the boy prefers his bedding ‘softly rumpled’ and not crisply flat, so no iron was used in the making of this bed. The Bright Stars organic 200tc bedding can be bought direct from the Fine Cotton Company. It’s available in double, single and cotbed sizes, and the single duvet cover is £45. 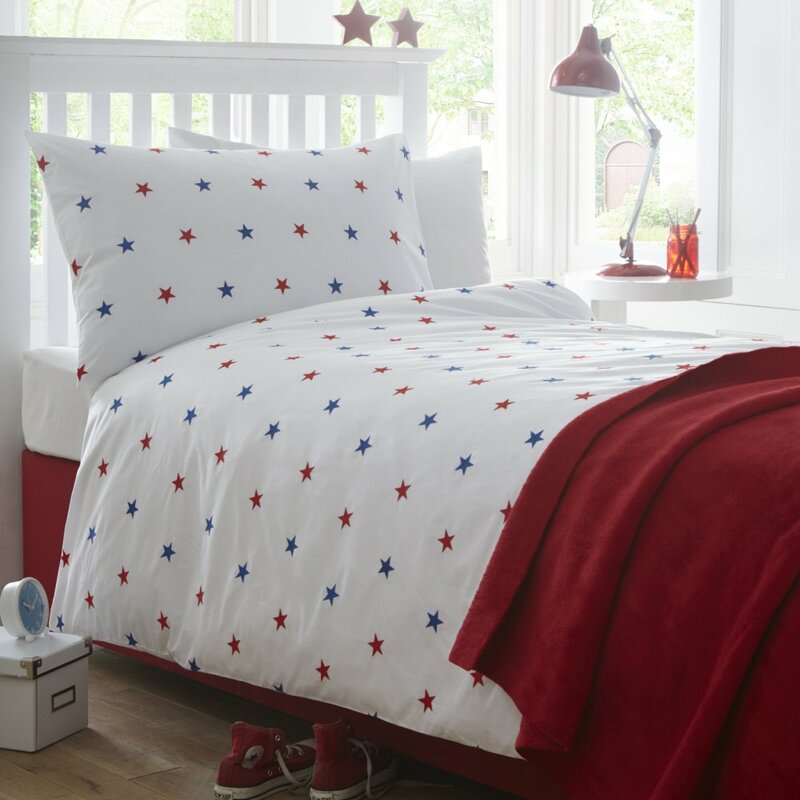 Just arrived, the Bright stars duvet cover collection for children any age. 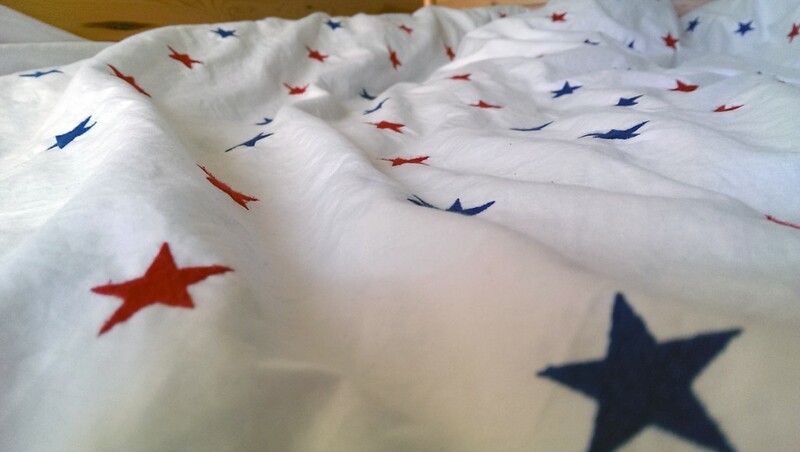 The duvet covers are made from 200 Thread Count Organic Cotton Percale embroidered with blue and red stars. In double, single and cot bed sizes. The pillowcases are available separately in standard and cot bed sizes. Are your children heading off to University this month? Whilst you cant keep an eye on them all the time, you can ensure they get a comfortable nights sleep with our specially selected bed linen and towels packs. There is a choice of organic cotton bed linen packs with duvet covers, pillowcases and sheets plus goose feather and down duvets and pillows – all featuring great savings. You can then pop in additional products such as a Towel Set, Snuggly Blanket and a cuddly bathrobe and slippers. The bedding can be delivered straight to their new home. The single set has 1 pillowcase and the double set includes 2 pillowcases There are 2 duvet covers to choose from – Boston, a New England inspired stripe and Vienna, a crisp white design featuring a one line satin stitch detail. The fitted sheet is from the Vermont bedlinen collection and is extra deep and made of 100% organic cotton. The single set has 1 pillow and the double set includes 2 pillows. The duvet is filled with new white goose feather and down and contains small fluffy feathers and light down clusters. They are made with a pure cotton percale 240-thread-count casing which is breathable & downproof. The mattress protector has a luxury quilted top and is 100% cotton. Back To Uni Towel Sets – There are 2 different sets – one including a face cloth, hand towel and bath towel; one with face cloth, hand towel and bath sheet. If you’re looking for a unique gift for Fathers Day, our Personalised Embroidered Pictures make delightful presents. On a white sateen ground with a short message, each picture is embroidered with the details of your choice and can be personalised with a greeting such as Love from Sophie. They may be gift wrapped and sent directly to the recipient. Happy Fathers Day Love From.. This month The Fine Cotton Company have launched the new gingham owls nursery bed linen design. Exclusively designed and made for The Fine Cotton Company in Europe from a luxurious and practical 200 threadcount. The front of the duvet is made from a woven gingham check in cotton, with a white embroidered panel across the top of the duvet and a white reverse in 100% organic cotton. Matching pillowcases are available separately. The pink gingham colourway has a beautiful lace trim detail with an embroidered owl motifs on the duvet and the pillowcase. The blue gingham colourway has an embroidered owl motif on the duvet and the pillowcase. The duvet cover comes in cot (100 x 120 cms) and cot bed (120 x 150 cms) sizes with matching cot bed pillowcases (38 x 60 cms) available separately.